Rajasthan plays a significant role in Indian Tourism Arena ,in which Jaisalmer is a Historic Tourist Destination in Rajasthan.Jaislamer is also Known as Golden City of India.Jaisalmer city is erected in the center of the Thar Desert .This article helps you to read more about the Jaisalmer City and it's important tourist spots. 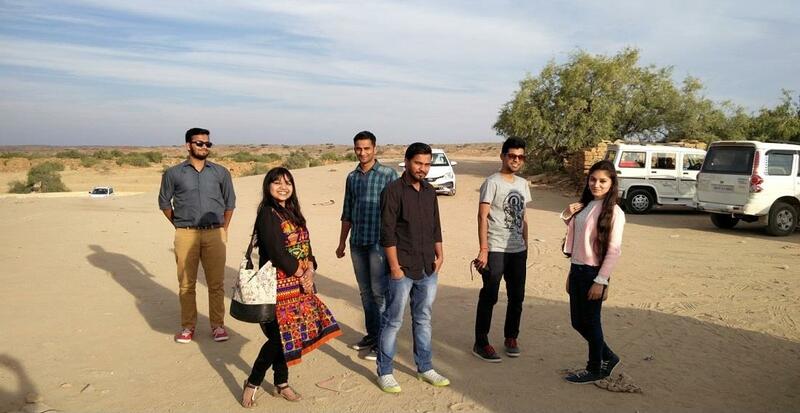 Jaisalmer, a planned trip in the final semester of MA, with best friends will always be a memorable trip. The crazy time spent with five friends will be cherished in the Campus. Hats off to me who decided to drive day and night to these beautiful places and not to forget the complete guidance of another friend through Google Maps. Jaisalmer is named after Maharawal Jaisal Singh, a Rajput king who founded the city in 1156 AD. "Jaisalmer" means "the Hill Fort of Jaisal". Its also nicknamed "The Golden City"( because the yellow sand and the yellow sandstone used in every architecture of the city gives a yellowish-golden tinge to the city and its surrounding area) and is a world heritage site as well and lies in the heart of The Great Indian Desert "Thar Desert." It was a fine evening of January; we traveled by Indian Railways to Jaisalmer from Delhi. Next Morning we crossed Blue City (Jodhpur) and finally at 1'O Clock in the afternoon we reached Jaisalmer. Since we booked our hotel early and it also provides complimentary pickup service from Railway station, driver was there already. We reached Hotel and we were ready for our venture at 3'O clock. After having our delicious lunch we started the journey at 4 for the Sam dunes (Part of Thar desert).It is almost 42 km away from the main city. Started our venture with a visit to Amar Sagar Jain Temple, followed by Kuldhara Village and then went straight to Sam Sand Dunes. On the way to Sam Sand Dunes, we explored our first destination Amar Sagar Jain Temple which is located adjacent to the Amar Sagar Lake and south of Lodurva, just 7 Km from Jaisalmer city. 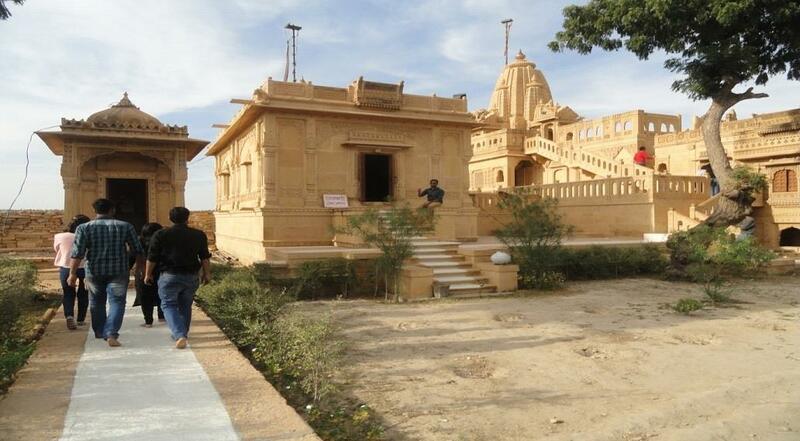 This Jain Temple is dedicated to Lord Parshwanath, called Adeshwar Nath Jain temple. It was was built by Patwa Bafna Himmat Ram in 1928. Beautifully crafted and designed the temples looks astonishing with its inner work and small domes. The golden Jaisalmer stones were used which shines gorgeously during the day. This temple was made in Dilwara style. Inside the temple, there are various figurines of animals and Lord Tirthankara. Other temples are also present near Adeshwar Nath Jain Temple, each of which is beautiful in its art and architecture. One can hire cab or rickshaw to reach here. 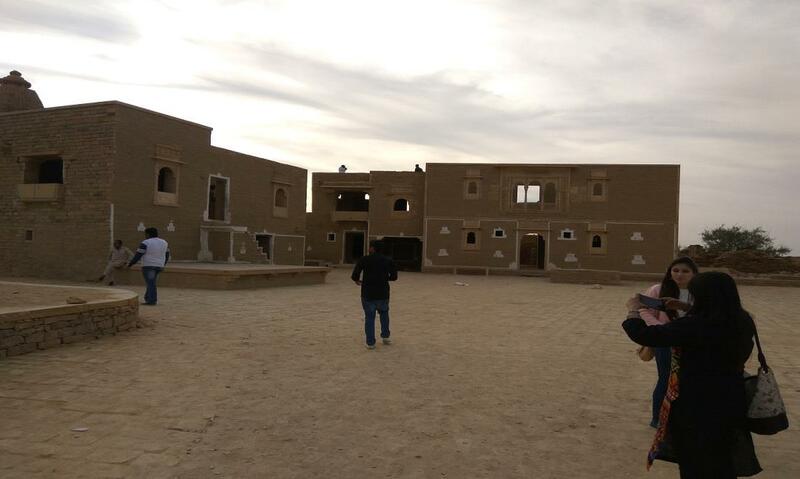 Our second destination was Kuldhara, an abandoned village, 34 Km from Jaisalmer city. Established around the 13th century, it was once a prosperous village inhabited by Paliwal Brahmins. It was abandoned by the early 19th century by unknown reasons, possibly because of lack of water and the atrocities of a Diwan named Salim Singh. The local legends claim that while deserting the village, the Paliwal imposed a curse that no one would be able to re-occupy the village. You can see ruins of hundreds of buildings and some of the buildings are same as Paliwals left it. One can experience a mind blowing sight scene here. Apart from sight scene, it is a good place with horror stories. If you come to Jaisalmer You should visit Kuldhara. Our Third and final Destination for day one was Sam Sand Dunes. We reached Sam Sand Dunes by 5'O Clock in the Evening. 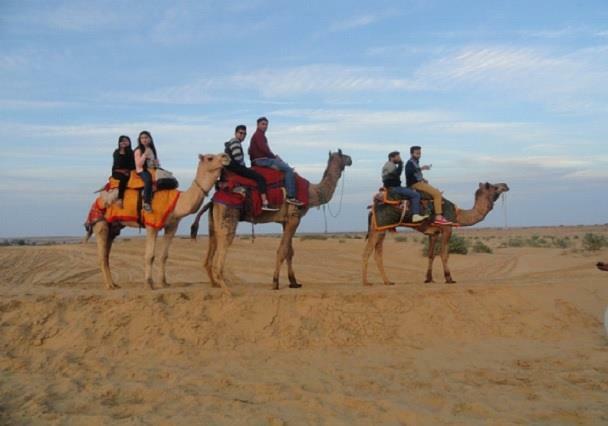 In 1700 per person Hotel Roop Mahal(where we stayed in Jaisalmer) offered us a package including jeep safari, camel safari, cultural show, dinner and 2-day transportation. 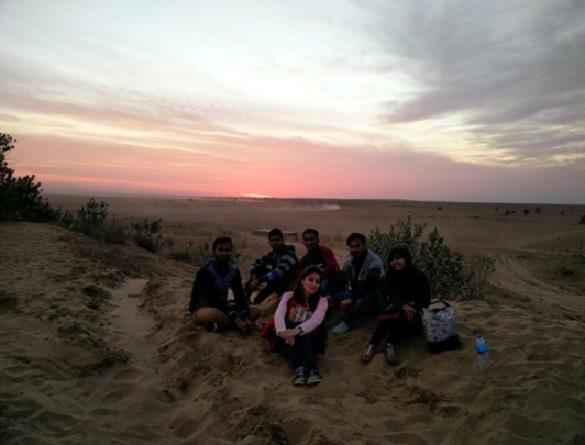 Since we already booked the night stay in Jaisalmer, we were unwilling to stay there in the night. As the part of the package, we had to go for a jeep safari first, we boarded a Mahindra Thar and went for a heavy ride in another sand dunes. We had our moment of joy, when the driver accelerated the Thar on the dunes and it rapidly descended on the dunes sideways. He did the similar activities 3-4 times and we were only struggling to hold our seats.Our jeep stopped there for half an hour and we stepped down to enjoy the beauty of those dunes. After the jeep safari, it was the turn for the camel safari. After camel safari, we moved towards sunset point and enjoyed the sunset. We clicked many pictures. It was getting dark, so returned back to desert camp with Thar. Now, it turned for the cultural programs.Cultural programs included some music programs and folk dances. Overall it was exciting. A very simple traditional Rajasthani dinner was offered by them. It included Dal, Bati, Churma, Rice, Ker-Sangri, and a local vegetable. 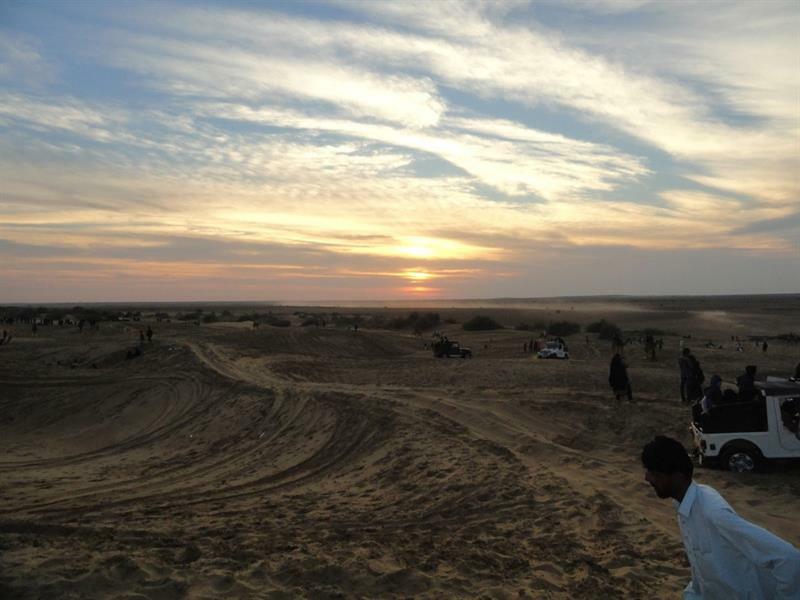 Since next day, we planned another ride to local city tour and my hotel was also booked in Jaisalmer I, we had to return back to Jaisalmer, after riding 42 km. We returned back and reached Jaisalmer around 10;30 PM in the night. Good information...Did you hire cab from Jaisalmer or used your own car?